Frugal Decor Tuesday again, oh how quickly this last week flew by. 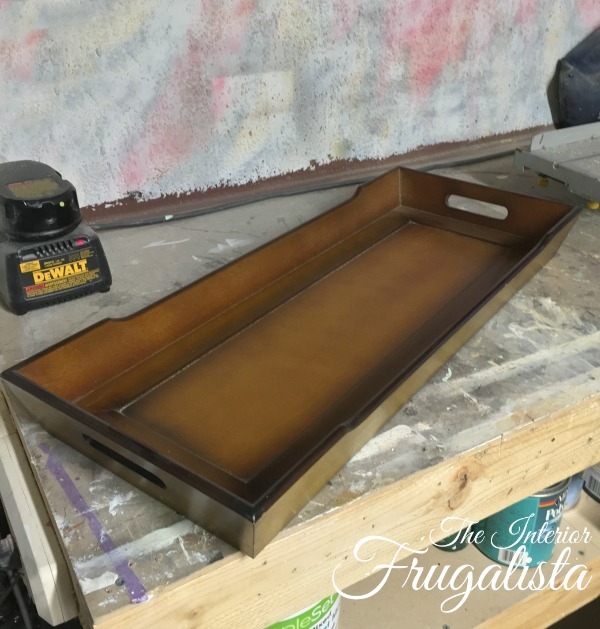 Today I'm sharing a long rectangular wooden tray Mr. Frugalista picked up during one of his lunch hour thrift store jaunts. I jumped for joy when he brought it home because it isn't often you find one this size and made out of wood. 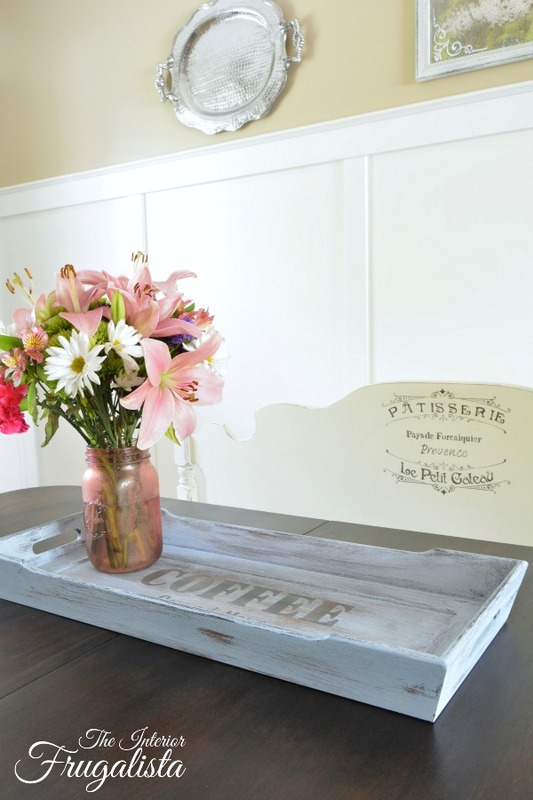 If you've been following me for awhile, you'll know that besides jewelry boxes, another of my favorite home décor makeovers is a thrift store wooden coffee tray transformation. I breathed new life into this one with a fresh coastal look for serving coffee. 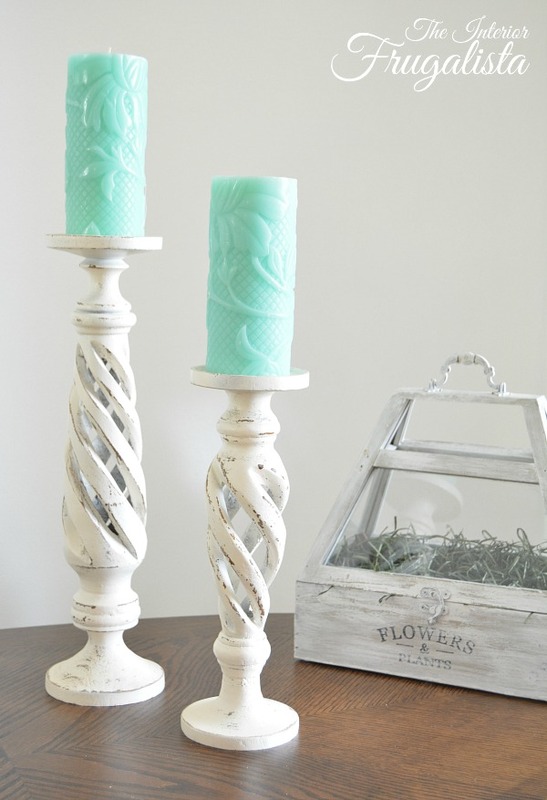 I applied one coat of chalk paint in the color Louis Blue from the Annie Sloan Chalk Paint line. Before the paint completely dried I distressed it with a wet cloth. I really should use this distressing method more often because it produces no dust. Before the paint dries but is dry to the touch, soak a clean lint-free rag into a bucket of water and wring it out so the cloth is wet but not dripping. Applying light pressure, rub the cloth to remove the paint in certain areas. See how mine is revealing some of the wood underneath? Next, I dry brushed the chalk paint color Hurricane from the Country Chic Paint line over the blue paint color. Dip just the tip of your brush into the can of paint and remove the excess onto a paper towel. With little pressure on the brush, apply the paint in random strokes. 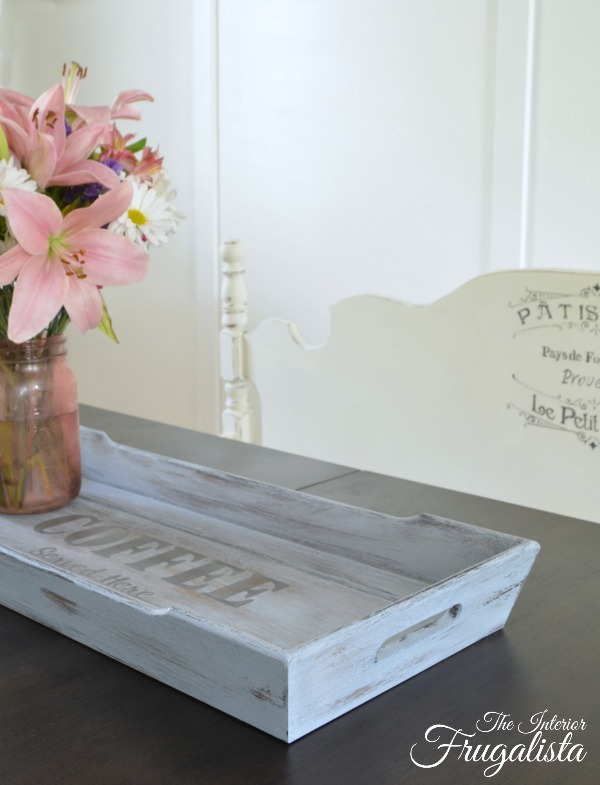 You've seen me use this fabulous COFFEE stencil from Funky Junk Interior's Old Sign Stencil collection a few times on the Rustic DIY Coffee Mug Holder and Rustic Serving Tray. I used the color Hurricane again to apply the stencil. At the outdoor market, I could have sold this tray 10 times over if it had said TEA, rather than coffee. Being a coffeeholic, I completely forget there are tea drinkers out there. The only time I drink the stuff is with Amaretto and Grand Marnier in a brandy snifter. Love my Blueberry Tea, especially in the winter. So at the next market, I must remember not to exclude the tea lovers. 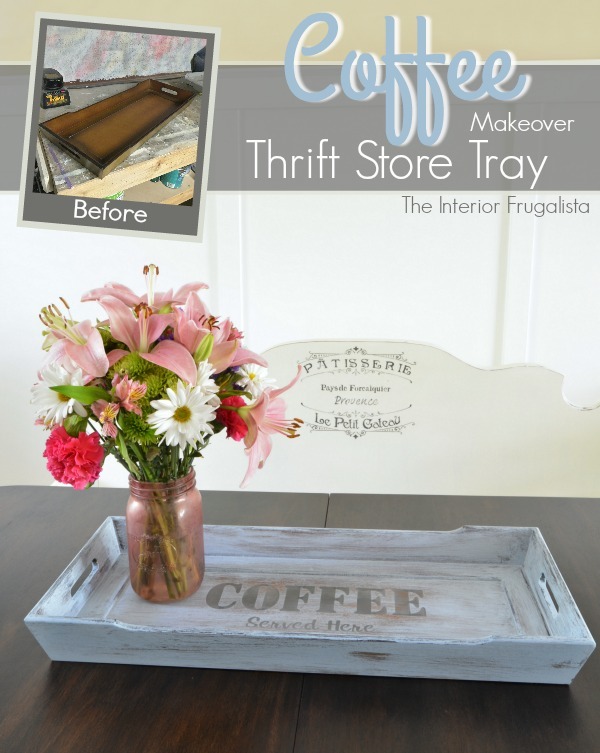 Have I inspired you to grab those trays off the thrift store shelves and give them a quick and easy REefresh? 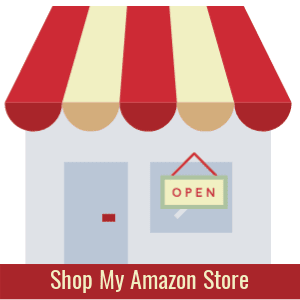 The wedding season is upon us and they make great gifts, just say'n! 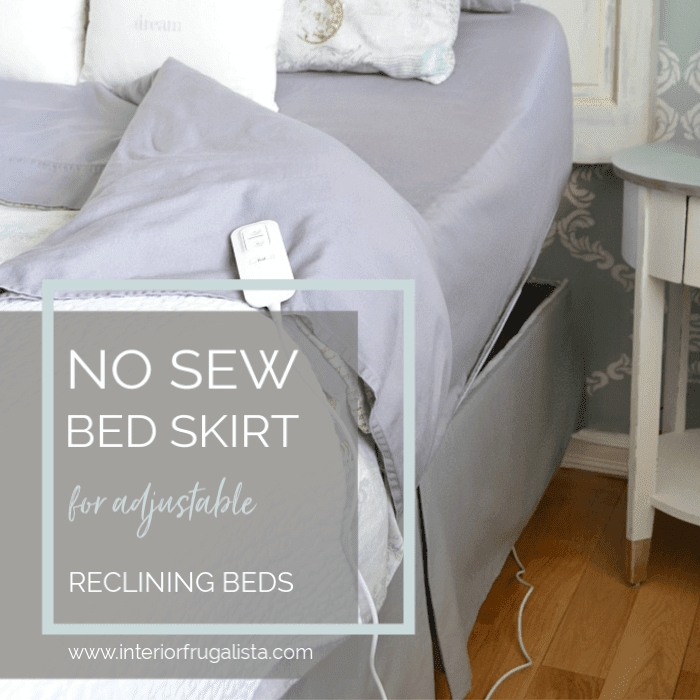 If you're looking for more inspiration, here are a few other trays that I've Refreshed. 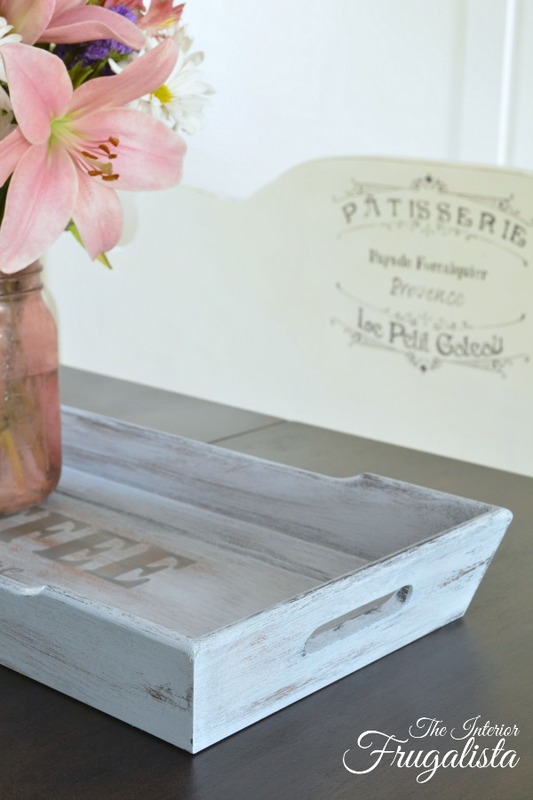 Plastic Tray Gets Chalk Painted Bliss and Tray Chic, pun intended. 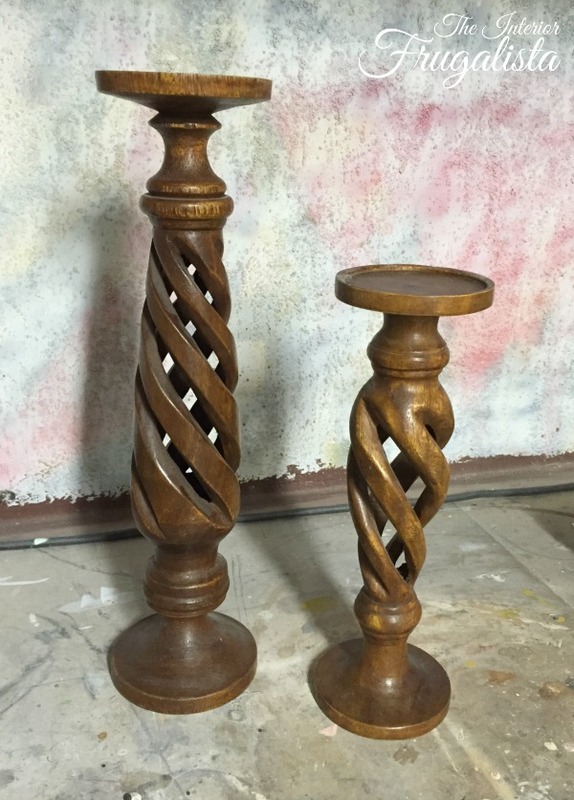 I thought I'd throw in a couple of candlesticks that I Refreshed for the market as well. Candlesticks come a dime a dozen on thrift store shelves and I especially love picking up the wooden ones. It never ceases to amaze me how a quick brush of white paint and a little distressing can completely transform them. They sold quickly at the market sans the pretty and nicely scented candles. I was selling them with the candles but a gust of wind hit the wall of the tent and knocked the candles onto the concrete floor, smashing the sides of each. One more thing before I close. It's Week 8 of the Between The Lines series and I don't want you to miss a thing. 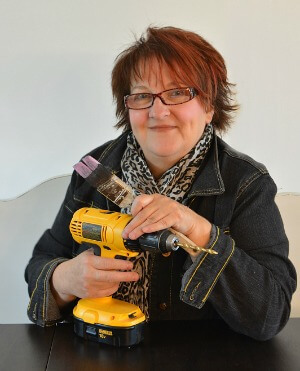 Be sure to come back on Thursday for the June edition of the Power Tool Challenge. This month's theme is Summer and I've got an easy DIY in store to share. You will find this project linked to these parties.